This CG animated film introduces the alien inhabitants of the Planet Glorf, including Meeper (its earnest but oh so awkward hero), the singing Diva, and the Zyzaks. Meeper warns the patrons of the Ale-E-Inn, an intergalactic watering hole, of impending danger only to find himself face to face with the toughest creatures in the universe. Won for Best Animated Short Film. Here’s a potential first in the world of DVD: a supplement that later comes out on its own. Granted, R2-D2: Beneath the Dome appeared in partial form on the Attack of the Clones DVD, but that disc essentially just offered a trailer; the separate release of Dome provided a longer program. That’s not the case for The ChubbChubbs. This animated short first ran prior to theatrical screenings of Men In Black II, and it also appeared as a bonus on the film’s DVD. Since that disc hit shelves in November 2002, the situation changed for Chubbs. It won as Oscar as Best Short Film, Animated, so I guess somebody at Columbia-Tristar decided Chubbs deserved a more prominent release. And they were correct. 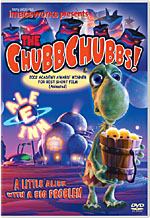 The most entertaining element of the Men In Black II DVD, Chubbs takes place on a distant planet at the Ale E Inn. We meet Meeper (voiced by Brad Simonsen), the establishment’s janitor who longs to sing on the joint’s stage. He goofs up on the job and gets fired. As he wanders outside, he meets a character who looks and sounds suspiciously like a much reviled Gungan. This dude warns Meeper that the ChubbChubbs are coming. When Meeper tells the Inn’s denizens about this, none of them listen, but they flee after another source relates the same information. Meeper sees a rampaging horde of monstrous beasties head toward the Inn, and he also notices a small band of cute and fluffy critters in their path. Meeper attempts to save the cuddlies from the evil forces, and the rest of the short follows the ensuing events. Like all good animated shorts, ChubbChubbs packs a lot of entertainment into its brief running time. Sci-fi fans will delight in all the cameos from various characters; the cartoon merits a few rescreenings just to see them all (unless you use slow-motion to cheat). ChubbChubbs never provides riotous humor, but it seems funny and lively nonetheless. It tosses a few curveballs at you and appears clever and inventive. It’s nice to see a cute and charming piece like this get Oscar recognition, and The ChubbChubbs definitely is an entertaining cartoon. 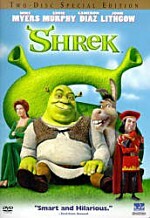 The ChubbChubbs appears in an aspect ratio of approximately 1.85:1 on this single-sided, single-layered DVD; the image has been enhanced for 16X9 televisions. Like most recent animated projects, Chubbs presented a vivid and robust picture. Sharpness seemed flawless. The film remained distinct and well defined at all times. I noticed no signs of softness or fuzziness in this detailed and crisp presentation. No issues with jagged edges or moiré effects occurred either, and I didn’t see any signs of edge enhancement. Not surprisingly, print flaws also appeared absent. I don’t know if Chubbs came from a digital-to-digital transfer, but it looked consistently free from defects. Colors seemed a little subdued for this kind of film, but that appeared to be a design decision and didn’t come across as anything related to the transfer. The hues generally were rich and warm, and they displayed no flaws like noise or bleeding. Blacks appeared dense and firm, while shadows were accurately opaque; low-light shots seemed well defined. I didn’t think The ChubbChubbs presented a truly amazing visual experience, but it looked very strong nonetheless. The Dolby Digital 5.1 soundtrack of The ChubbChubbs also seemed quite satisfying. The soundfield offered a good five-channel mix that kept the different speakers active. Between the bar setting and the attack of the monsters, the short film included lots of opportunities for broad audio, and the track made nice use of them. Various elements popped up in appropriate places and they moved across channels effectively. The surrounds kicked in with a lot of unique elements and helped make the track work well. Quality also seemed positive. Speech was distinct and concise, with no problems on display. Music sounded bright and bouncy, which fit the setting. The score and songs were clear and distinctive, and they showed solid range. Effects demonstrated fine definition and accuracy, and they lacked any signs of distortion. Bass response was tight and deep. The low-end never appeared loose or boomy, as bass sounded firm and rich. The audio of ChubbChubbs did its job well. As for supplements, ChubbChubbs only tosses in some trailers. Actually, it includes tons of them. We find ads for Anger Management, Daddy Day Care, Charlie’s Angels: Full Throttle, Men In Black II, I-Spy, Columbia-Tristar’s “Family Fun” and “TV Comedy Favorites” titles, National Security and Adam Sandler’s Eight Crazy Nights. All the film promos present anamorphic 1.85:1 picture with Dolby Digital 5.1 audio. The absence of any substantial extras keeps the DVD of The ChubbChubbs from becoming a definite purchase. The short film itself seems very charming and delightful. It comes across as sly and frisky but not overbearing or self-conscious as it mildly spoofs sci-fi movies. The DVD offers very fine picture and audio, but it lacks any compelling supplements. And there’s the obstacle to recommendation. If you already have the Men In Black II DVD, there’s absolutely no reason to consider a purchase of ChubbChubbs on its own unless you just adore unrelated trailers. Frankly, with a list price of almost $10, ChubbChubbs seems a little expensive for what you get. Had we found some features that delved into the short, it’d be much more worthwhile, but without those, it doesn’t seem like a very good deal. This is a toughie, because I really did like ChubbChubbs. I recommend the film itself, and if you don’t mind the price, I’d advise you to get it. Better yet, if you find a cheap copy of Men In Black II, pick up that instead. I didn’t care for that movie, but at least the set includes pieces that make it a better value. The flick’s a dud, but the DVD provides some entertaining supplements, so I’d rather own it as a way to possess ChubbChubbs rather than drop ten bucks for this sparse presentation.